While the Reds struggled to a third consecutive last-place finish in the National League Central Division, the organization's rebuild started to take shape. An impressive crop of talent has been highlighted by a handful of first-round selections who are already paying handsome dividends. With the exception of the No. 2 overall pick in this June's Draft, Hunter Greene, each of the club's first-rounders in the past four years cracked our Organization All-Star selections. Cincinnati's farm system shows a great balance between a group knocking on the door to "The Show" and prospects who will require patience in development. Of the 12 players on this list, five have yet to reach the Double-A level while three have played on the Triple-A circuit and two already debuted in the Majors. Catcher -- Tyler Stephenson, Dayton (80 games): Even with his season cut to just 80 games by a thumb injury, the Reds' 2015 first-round selection proved he can still be the catcher of the future in Cincinnati. "Even though he was repeating the Midwest League, he's still just 20," said Jeff Graupe, Cincinnati's senior director of player development. "He's still on a younger end for the league." Stephenson hit .278/.374/.414 with six homers, 22 doubles and 50 RBIs for Class A Dayton. The club's eighth-ranked prospect earned Midwest League All-Star honors before he was shut down for the year with a torn ligament in his right thumb. It marked his fifth stint on the disabled list in the past two seasons. "He really took a step forward. He really did a nice job leading a young pitching staff," Graupe said. "I thought the offense that he put up in those 80 games was impressive for the position especially and the hitting environment." First baseman -- Gavin LaValley, Daytona (61 games), Pensacola (67 games): The 22-year-old clubbed a career-high 18 homers between Class A Advanced Dayton and Double-A Pensacola. "I think he's understood who he is as a player and he's embraced that and he's working towards it," Graupe said. LaValley caught fire early in the season, belting his first 15 homers through 61 games in the Florida State League while batting .288/.332/.538 with 45 RBIs for the Tortugas. His power numbers decreased following his promotion to the Southern League, but the No. 20 Reds prospect increased his doubles tally from 14 to 16 over the final 67 games of the season. Second baseman -- Alex Blandino, Pensacola (62 games), Louisville (63 games): In his fourth professional season after being selected out of Stanford in the first round of the 2014 Draft, Blandino did not disappoint during his first taste of the International League. "I think in 2016, he was significantly hampered by some hamstring issues that kept slowing him down," Graupe said. "This year, I think he was stronger, he had his base back. I think you saw it in his offense, in his ability to drive the ball. He took a ton of quality at-bats." The 25th-ranked prospect in the organization hit .270/.390/.444 in 63 games at Triple-A Louisville after beginning the season in Pensacola and finished with 12 homers, 36 doubles, 64 RBIs and 60 runs scored -- all career highs. Third baseman -- Nick Senzel, Daytona (62 games), Pensacola (57 games): Another first-round gem for Cincinnati, Senzel earned his status as the team's top prospect by batting a combined .321/.391/.514 with 57 extra-base hits and 65 RBIs across two levels in his second professional season. "We continually try to challenge Nick, putting him in difficult environments and moved him along," Graupe said. MLB.com's eighth-ranked prospect made a bid for a Major League promotion before his season ended prematurely, first with an injury to his left wrist before a bout with vertigo shut him down for good. Senzel was bumped to Pensacola after 62 games with Daytona and hit .340/.413/.560 over the final 57 games with Pensacola. "He's a pro's pro. He goes about it the right way, he does everything the way you'd want to model a young kid to go in his progression to the big leagues," Graupe said. "Very process driven, very organized with his thoughts -- understands where he wants to go. His tireless work ethic will allow him to get there." Shortstop -- Alfredo Rodriguez, Daytona (118 games): Signed out of Cuba for $7 million last July, the 23-year-old shined in his first full Minor League season after a 22-game stint in the Dominican Summer League in 2016. He led Daytona with 122 hits in 118 games and eventually finished with a .253/.294/.294 line. Although his offensive breakout is likely still to come, Cincinnati's ninth-ranked prospect showed off an impressive aptitude at the position. "Everyone came in and left with an Alfredo Rodriguez story about some defensive play that he made that was just absolutely jaw-dropping," Graupe said. "I think he really did a nice job acclimating, which is difficult … with the cultural assimilation that goes with it. Offensively, I think he competed. I think he's got more in the tank that we'll see next year." Outfielders -- Jose Siri, Dayton (126 games): While putting together one of the best years at the level, the fourth professional season for the 22-year-old was highlighted by a Midwest League-record 39-game hit streak. "It was incredible," Graupe said. "You love to see a guy have that kind of success." The No. 22 Reds prospect hit .293/.341/.530 and led the circuit with 146 hits, 92 runs scored, 46 stolen bases and 11 triples. He also finished second in the Midwest with 24 homers and fourth with 76 RBIs while contributing 24 doubles. "I think he's refined his approach," Graupe said. "He's allowed himself to be more consistent day in and day out. His physical tools are off the charts." Taylor Trammell, Dayton (129 games): MLB.com's No. 67 prospect showed off his above-average running speed with 41 stolen bases in his first full season, finishing second to Dayton teammate Siri in the Midwest League. The third-ranked Reds prospect tied for second on the circuit with 77 RBIs while batting .281/.368/.450 with 13 homers, 10 triples, 24 doubles and 80 runs scored. "The power-speed combo was impressive. The makeup is off the charts," Graupe said. "I think he's the kind of guy that hopefully can take a positive season and set the bar even higher moving forward." Andy Sugilio, Billings (62 games): Sugilio rose above the surface in an organization with a deep pool of outfield talent, even as a converted infielder. "I think his defense and baserunning were things that took a nice step in the right direction this season," Graupe said. "Hopefully he's just the next in that successful progression of young outfielders." In his fourth season since signing out of the Dominican Republic, the 20-year-old led Rookie-level Billings with a .345 average and 20 stolen bases. Sugilio finished in the Mustangs' top three with a .390 on-base percentage, 45 runs, 13 doubles, four triples and 40 RBIs. "Andy is a guy that we expected to go up there and do well," Graupe said. "To see him go up there and play well offensively wasn't a surprise." Right-handed starting pitcher -- Tyler Mahle, Pensacola (14 starts), Louisville (10 starts): Although Mahle's season couldn't have started much better, with a perfect game in his fourth start of the year for Pensacola, the ending was probably a bit sweeter for the 23-year-old. "He's performed everywhere he's ever been." Graupe said. "Extremely bright, extremely hard worker. The kind of guy that you want to root on for success." The Reds pulled their fourth-ranked prospect up to the big club for his final four starts to the year after he amassed a combined 10-7 record with a 2.06 ERA and 138 strikeouts while holding opponents to a .206 average over 24 starts. 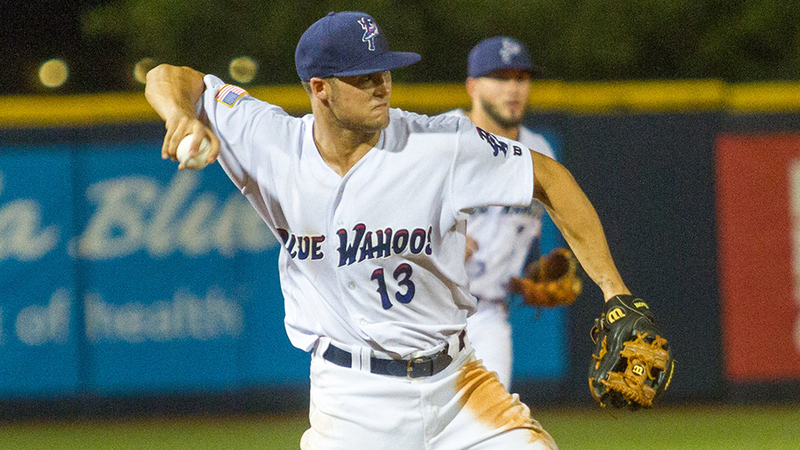 Mahle earned his first promotion to the Triple-A level on June 22. "He went out and he commanded his fastball. He's got a breaking ball ... he throws his changeup effectively," Graupe said. "This is a guy that can mix it up and just really, really perform." Left-handed starting pitcher -- Scott Moss, Dayton (26 starts): The Reds attempted to ease Moss' transition from the University of Florida to professional ball last season, but turned their No. 29 prospect loose for 135 2/3 innings for the Dragons in 2017. "Coming off of kind of a checkered injury history in college, we wanted him to have a nice season and he did that," Graupe said. Moss led the team with 146 strikeouts and compiled a 13-6 record with a 3.45 ERA. His splits did not find him to be particularly tougher on left-handed hitters than on righties, but show he projects as a front-end starter in the future. "He pitched really well, he was very high in our organization in strikeouts, threw a good amount of innings, won a lot of ballgames," Graupe said. "[He] went out there and really got to pitch a season unrestricted for the first time in a while." Relief pitcher -- Kevin Shackelford, Louisville (35 games): The 28-year-old posted dominant numbers out of the Louisville bullpen before earning his first call to the Majors in his eighth professional season. "Kevin is another guy that really, over time, has forced his way to the big leagues," Graupe said. Shackelford finished with a 1.35 ERA in the Minors and converted on 12 of 14 save opportunities over 35 games with the Bats. The 6-foot-5 right-hander struck out 61 batters in 47 innings for Louisville. "Really good fastball-slider combo. Good angle. Attacks hitters and really dominated at the Triple-A level," Graupe said. "I think he refined his pitching ability and I think he took a step forward with his mental game."